Ya know, every year during Advent, life gets busier and busier. I have a growing number of students in my homeschool class and that just makes life a little more crazy. I'm trying to keep the focus on Jesus and giving to the needy, but I still feel like the season is almost over and I was barely was able to take the time to meditate on the true meaning of the season! Personally, my mediation and prayer time is always filled with interruptions and a two year old who jumps on my back or slams his affectionate body into my stomach, while screaming, "Hug!! ", in a long drug-out word! Sweet, but very distracting. So sitting and praying is often not the peaceful time in my day. Prayer in the bathroom is as peaceful as it gets - assuming I can sneak away without being seen! Otherwise, I hear banging on the door while my wild and crazy fan club screams on the other side! So prayer time is rather difficult most days. I found that prayer time can be more meaningful if I'm working on something. For starters, my kids bother me less when they see me actively doing something. Why it's that way I have no idea! But I like to use it to my advantage! And secondly, I find it easier to focus on prayer and mediation when I'm working with my hands. Creating, coloring, painting, drawing, and other things like that. Growing up I was told by my teachers that you should be focusing on prayer and not be doing other things while praying, but as an adult, I find that even my kids pray better in motion. My kids, mainly my oldest son, wants to walk while praying the Rosary! So maybe it's a genetic thing in my family or maybe it's just because God made us all different, but it works for me! Well, that may have been a bit of a personal tangent, but I was thinking about it as I made the craft that I'm about to share. 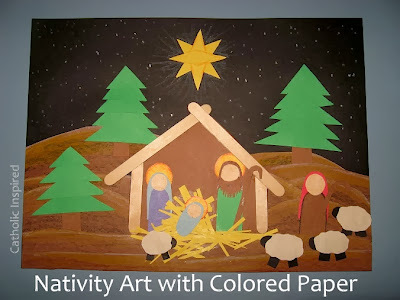 While making this art project sample for my kids, I began to realize why I enjoy creating things and I was having a splendid time meditating on the birth of Jesus! 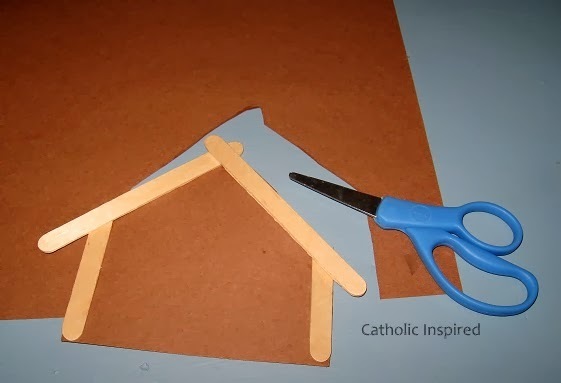 First I broke a popsicle stick in half and glued the two whole sticks and the two parts onto the brown paper. 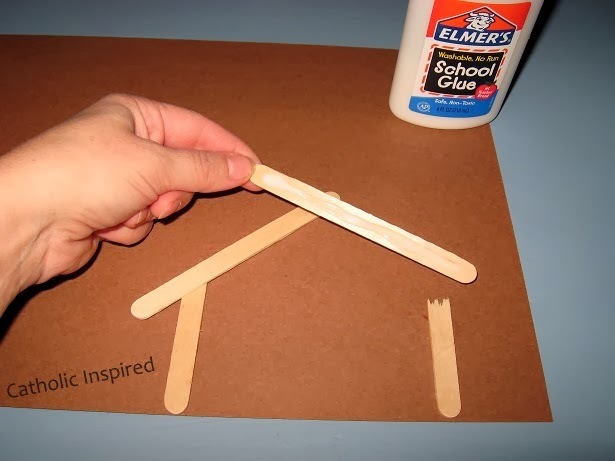 Create a stable shape. 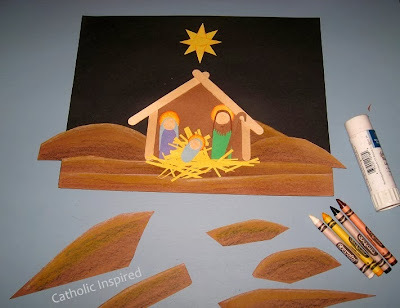 Now using your blue, green, and brown paper cut a half oval shapes to make the bodies of Mary, Joseph and a Shepherd. You can also cut our half oval shapes to make a veil/head covering, too. 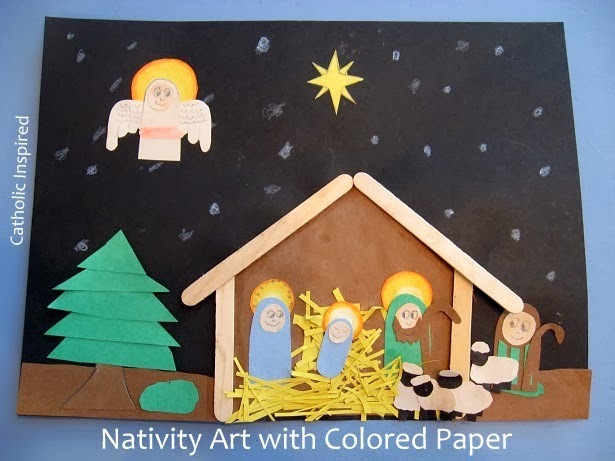 Baby Jesus is a small oval shape. Use white paper to make circles to use as the heads. 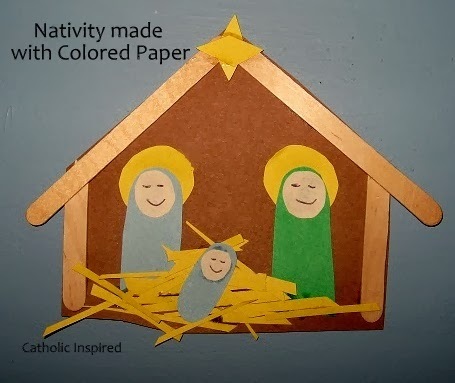 I used a peach crayon to make the white paper a skin color. 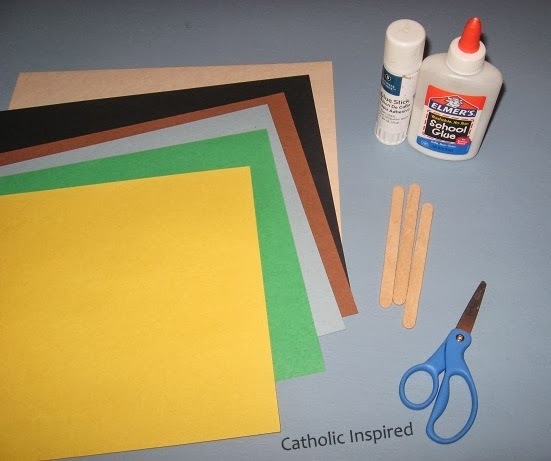 I also used brown to make St. Joseph's head covering to be a darker brown. Cut some yellow paper into strips to make the hay. 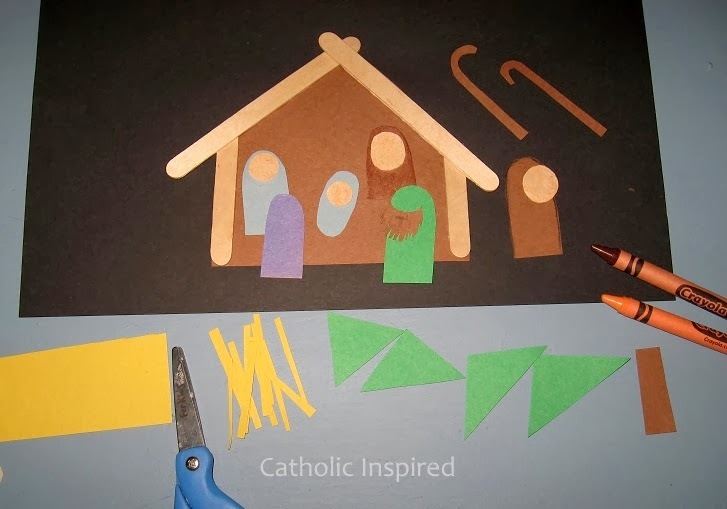 You may also cut out staffs for St. Joseph and the shepherd. I also cut out yellow paper halos (not pictured) for the Holy Family and colored them with orange and red. 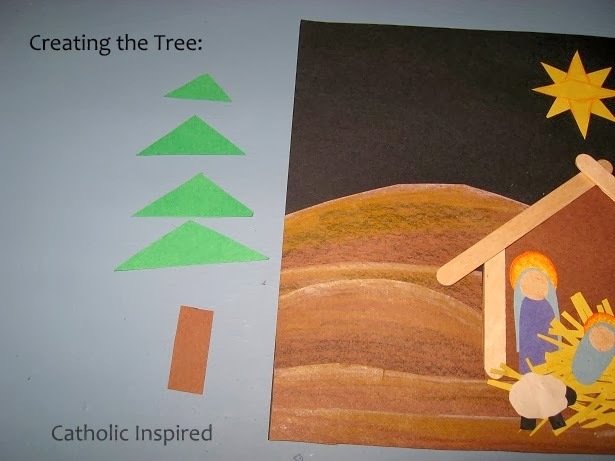 (The other parts pictured above are for a tree... I'll talk about that later.) You may like to wait till you have the ground and hills glued down before you glue on the hay and people. The image above shows the parts and the way I formed a star. It's two long diamond shapes and 4 long triangle shapes. 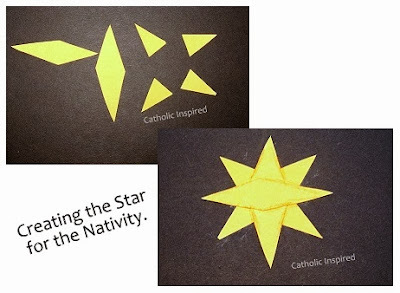 The were layered to make a star. 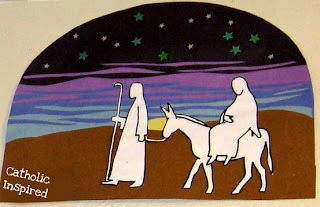 I glued them above the stable in the black sky. Next I made a few hills to fit around the stable. 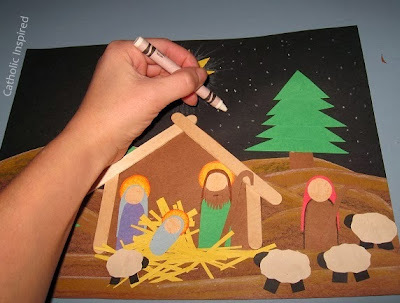 I used a black and/or brown crayon to lightly color the bottom of each hill. I added yellow to the top and a small edge of white to the very top of each. This helped to give the hills some dimension. Once I had the ground/hill glued down in front of the stable, I glued down Mary, Joesph, the hay, and baby Jesus. 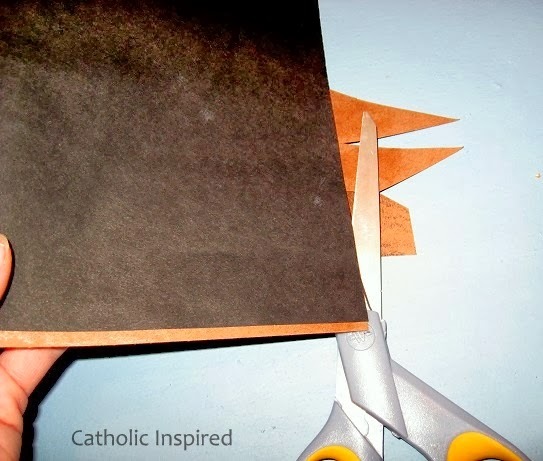 After I glued down all my hills with the glue stick, I flip the picture over and cut off the extra edges of the hills. The shepherd and the sheep were added next. 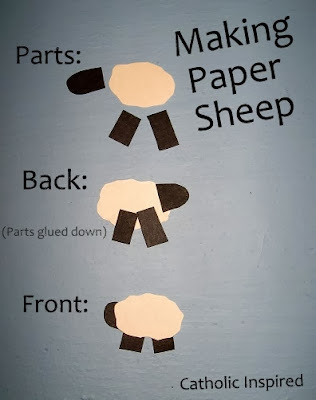 The image above shows how I created the sheep with white and black paper. 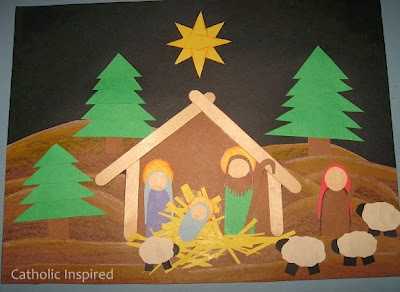 Once I created the sheep and the shepherd I glued them onto the picture. Next, I added the trees. I made several green triangles and a brown trunk for each. I layered the green triangles starting from the bottom (at the trunk) and working to the top. The last and final touch is the other stars in the sky! Using a white crayon I made small dots all over the black sky. The art work above was created by my daughter, Elizabeth, and my son, Joshua. A great team project! They worked together very well and it looks so sweet! If you are looking for something super simple you can make one like my younger kids made. 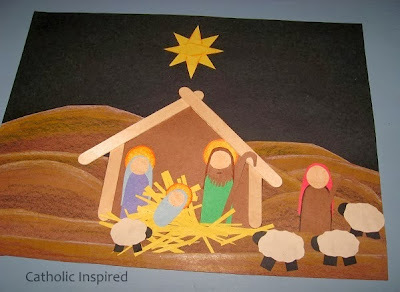 It's just the stable and the Holy Family! Have a blessed O Antiphon! You always have such great ideas. 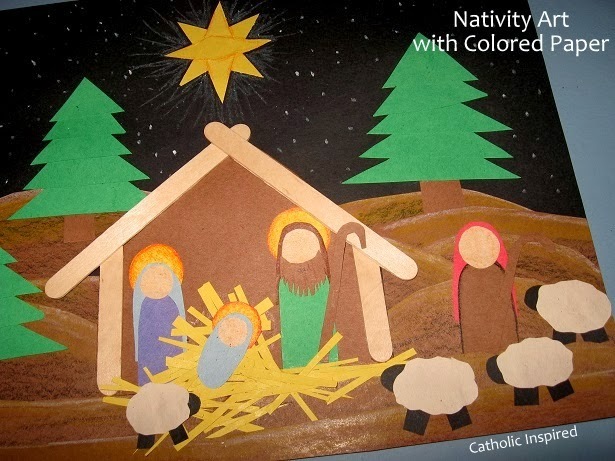 I hope that you and your family are having a blessed and fruitful Advent. Oh, thank you so much for stopping by, Christine!! (3) May you and your beautiful family have a blessed Advent and Christmas season!